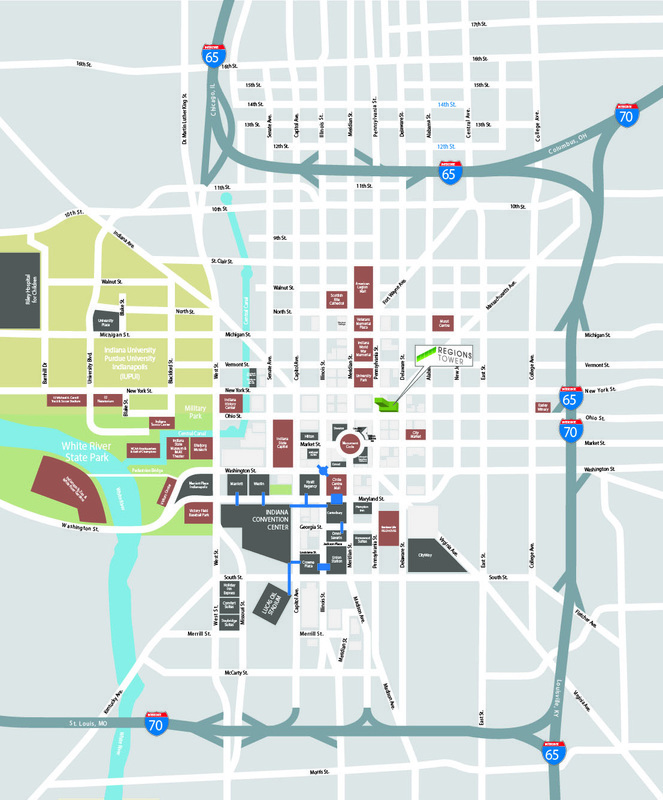 Regions Tower is ideally situated in the heart of Indianapolis’ increasingly vibrant downtown area along Ohio and New York Streets, the major east-west thoroughfares, and Delaware and Pennsylvania Streets, the major north-south thoroughfares. The Property is located one block northeast of Monument Circle, the 274 foot limestone Soldiers and Sailors Monument that is traditionally known as the focal point of downtown Indianapolis. With its paramount location, the Property is surrounded by unsurpassed transportation, professional and cultural amenities. As today’s work environments continue to stress the importance of a healthy work-life balance, Regions Tower stands at the core of the city’s business and cultural districts, setting a standard of excellence to which all other office properties are compared. The Property's superior amenities and incomparable location consistently attract the market's most sought after tenants. Over the past two decades, downtown Indianapolis has transformed into a vibrant 24/7 urban center. Cities across the country look to downtown Indianapolis as a revitalization model. Since 1990, Indianapolis has invested over $9 billion of public and private funds into more than 490 projects, representing an average annual investment of more than $391 million. Furthermore, the downtown evolution is not complete, with 75 projects totaling $3 billion proposed and in the pipeline. These developments set to be complete by 2017 and averaging $500 million annually, include additions like the new Riley Hospital Simon Family Tower at Indiana University, Indiana University Health Neuroscience Center and The Axis at Block 400. One of the most acclaimed projects, now in its second phase of development, has been CityWay, an innovative, $515 million urban mixed-use community featuring 250 luxury residences, a 75,000 square-foot YMCA, 40,000 square feet of retail/restaurant space with additional expansion space for 60,000 square feet, parking, urban green areas, a public art component and the Alexander Hotel. As the downtown landscape continues to evolve with over 700,000 qualified office workers, a growing number of corporations are choosing to locate or expand in Downtown Indianapolis. Three FORTUNE 500 companies’ world or regional headquarters in downtown Indianapolis continue their commitment through growth and expansion including WellPoint, Inc., Eli Lilly and Company and Simon Property Group. Rolls-Royce moved 2,500 employees downtown in 2012, which is expected to boost the downtown economy by $510 million each year due to spending by the company and its employees. ​With over 1,700 Salesforce employees and plans for expanding, Indianapolis is home to the company's second largest office outside its San Francisco headquarters. StreetLinks Lender Solutions recently announced they will relocate 200 employees from the far south side to their new CBD headquarters. NCAA’s $40 million, 150,000 square-foot headquarters expansion completed in 2012. Simon Property Group opened a $55 million headquarters building downtown in late 2006.